Now, for around Rs 15 lakh, you can buy a Jeep! How cool is that? The much-awaited Jeep Compass was launched on 14 July 2018 at a mouth watering base price of Rs 14.95 lakh (ex-showroom, New Delhi). It has surely sent shockwaves across multiple SUV segments as it overlaps with a lot of products, including the Tata Hexa and Mahindra XUV500, while undercutting its direct rivals. Here are five things we like about the made-in-India Jeep Compass. There’s nothing to crib about its pricing. No, absolutely nothing! The base price is way lower than what people were expecting. It is also more or less similar to the USA-spec model, which starts at $20,995 (approximately Rs 13.45 lakh). The Compass' Rs 15.35 lakh base price has helped it undercut its closest direct rival, the Hyundai Tucson, by almost by Rs 3 lakh! And it tops out even before other SUVs from this mid-size segment start and that too with a 4x4 drivetrain. It seems like the upcoming Renault Captur, which is likely to be priced in the same range as the Compass, is going to have a hard time! Jeep certainly has a relatively higher snob value than other manufacturers in this price range. It followed a top-down approach for its Indian operations – from Grand Cherokee to the Compass – making an impression of a premium manufacturer. Customers would be happy to buy the Compass considering the fact that it looks like a baby Grand Cherokee (check out the image below), which starts at Rs 75 lakh (ex-showroom, New Delhi). The Compass features powerful direct-injected turbocharged petrol and diesel engines. In the sub-15 lakh bracket, the Compass has become the most powerful vehicle with its 162PS 1.4-litre turbocharged petrol motor mated to a 6-speed manual. The diesel is a rocket in itself! From a 2.0-litre motor, the Compass diesel puts out 173PS of max power and 350Nm of peak torque. While a 6-speed manual is standard with both the engines, the petrol also offers a 7-speed dual-clutch automatic. Besides the launch of the Compass, Jeep has also introduced FCA’s famed Mopar brand for the after sales and customisation. If you remember Mopar was first showcased at the 2016 Indian Auto Expo. As of now, there are 48 Mopar authorised workshops throughout the country for 50+ Jeep dealerships. 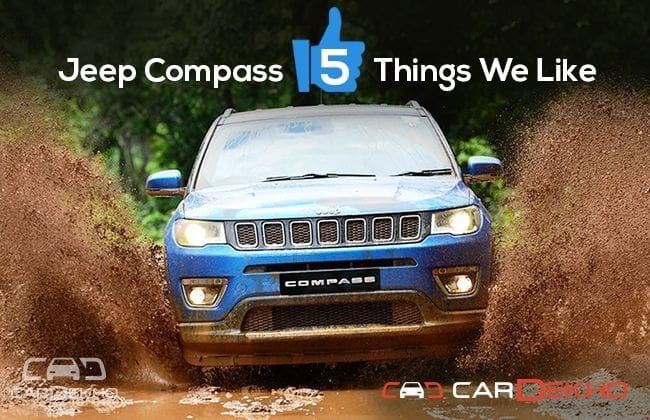 You're getting three years or 100,000km warranty on the Compass along with three years of RSA (road side assistance) and 24/7 Mopar support for free! It has a service interval of 15,000km or a year, whichever comes early. Also on offer is Mopar maintenance packages, tyre and battery care. You can also opt for Mopar extended warranty. Then there are Mopar accessories and merchandise. It is something really exciting since (although) FCA’s existing after sales support (for Fiat) is nothing to speak of, it is improving.